The chair is the only known surviving fauteuil en bergère (ie. 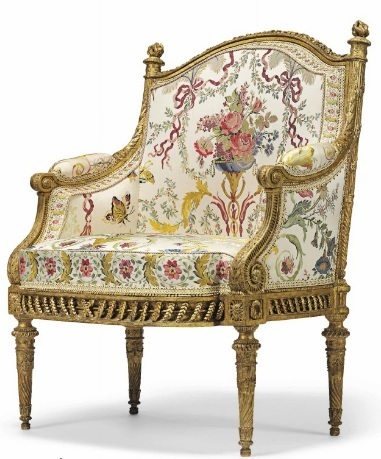 an armchair with filled-in sides) from a set made by the celebrated cabinetmaker François-Toussaint Folliot for the pavillon du Belvédère. The suite, which is known to have cost 20,000 livres at the time, was the most expensive ever produced. The suite was eventually dispersed in the Revolutionary sales. On September 4, 1793, just five weeks before Marie-Antoinette's execution, all sixteen pieces are recorded as sold to one “citizen Sellièr” for a mere 2530 livres. The fauteuil last appeared at auction in Paris at Sotheby’s on June 27, 2001 when it was sold as part of the collection of the well-known antique dealer Luigi Anton Laura. The lot has been on long-term loan to the Louvre. Christie's have not identified either the 2015 seller or the new owner. 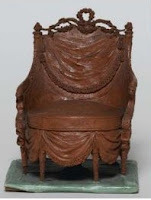 Six of the side chairs are known to survive:, five are in the Getty Museum and a single one in Versailles, donated by Edmond de Rothschild in 1990. St. John's Eve - pussycat auto-da-fé? Fake chairs in High Places!